Nate Hood already reviewed MANCHESTER BY THE SEA (the review is here) but I wanted to chime in with a few additional thoughts of my own. A solid drama, MANCHESTER was never the heartbreaking tale of grief that most of the early reviews have painted it to be. 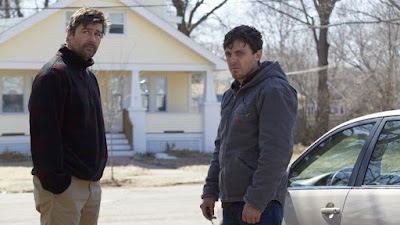 A moving and quite funny film (its a film from Kenneth Lonergan so how could it not be) its a very good film but not quite the Oscar front runner that many have it pegged to be. For those who don't know the film revolves around Casey Affleck's return to his home town in the wake of his brother's sudden death. tasked with taking care of the funeral arrangements and his teenage nephew. Affleck wants to get the hell out of dodge since it's kicking up too many memories about a tragedy several years before that left him closed up tight and unable to relate. The problem for me with the film is that too much of the story and emotions are off screen. We don't know what made Affelck's nephew so closed off and disconnected. He's more interested in getting laid than in the death of his dad. Additionally we have an emotional moment where Affleck's ex emotionally tells him she's sorry for things said. We can infer what happened but we don't know for certain. We have to bring a great deal to the film, which is fine, but at times it's asking too much because there simply isn't enough to hang our suppositions from. Don't get me wrong- I like the film but having two closed up characters is too much to ask, especially when things flip at a certain point and a running gag about trying to sleep with one of two girlfriends takes over. Definitely worth seeing, but don't expect the world. The film screens again at NYFF on October 11. For tickets and more information go here.